Infectious mononucleosis, also known as kissing disease is an infectious disease caused by a virus of the herpes family called Epstein-Barr virus (EBV). It transmitted through saliva. Mono is most common in adolescents and young adults and is characterized by symptoms of fever, sore throat and swollen lymph nodes. The Epstein-Barr virus is transmitted from human to human through saliva. For this reason it earned the nickname "the kissing disease". In addition to kiss, mononucleosis can be spread through coughing, sneezing, objects such as cups and cutlery or otherwise where there is contact with the saliva of an infected person. A person infected with Epstein-Barr can keep up with the virus in their throat for up to 18 months after the resolution of symptoms and can infect people who keep a close contact, especially prolonged. That's why most people who develop mononucleosis do not usually remember having had contact with someone ill. The person who transmits the virus also does not even realize that they can still pass it. No wonder, therefore, that despite the low infectivity, in some countries more than 90% of adults have already had contact with the virus of mononucleosis. You may already be thinking about these 18 months. Can I transmit mononucleosis for 18 months! This means that I can not kiss anyone for almost two years? Not exactly. Let us explain. In most cases, people have their first contact with the virus of mononucleosis as a child. This infection goes unnoticed because mononucleosis virus does not usually cause disease when acquired in childhood. In fact, less than 10% of children who become infected with Epstein-Barr virus develop any symptoms. Therefore, the vast majority of the population have had contact with the virus of mononucleosis and already have antibodies and are immune to the virus. The cases of mononucleosis in adolescence and youth occur in that minority that was not contaminated by accident as a child. Contrary to what occurs in children, adolescents and young adults with infectious mononucleosis usually cause the classic symptoms, which are explained later in this text. It is also important to note that although the transmission mode is similar to influenza, Epstein-Barr virus is less infectious, which makes it possible to have contact with infected persons and not become infected. Infection occurs only after prolonged contact with an infected person to another who has never been exposed to the virus. So when you add the fact that most of the population is already immune to mononucleosis with low natural infection rate of the virus, the risk of transmission between youth and adults is very low. Soon, once cured of symptoms, there is no reason to prevent anyone from dating. As have just been explained, when acquired in childhood, mononucleosis usually goes unnoticed. Less than 10% of infected children show symptoms. This incidence begins to rise over the years, reaching its peak between 15 and 24 years. This is the age group that most often presents a symptomatic infection. Mononucleosis is rare after 30 years, since virtually everyone in this group will have been exposed to the virus at some point in life. In people who develop symptoms incubation period, i.e., from the contact until the onset of disease, is on average 4 to 8 weeks. Typical symptoms of mononucleosis include fever, fatigue, sore throat and swollen lymph nodes in the neck (lumps). 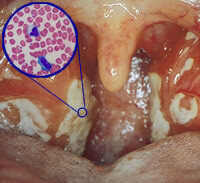 It is very similar to pharyngitis caused by other viruses and bacteria. Other nonspecific symptoms, such as headache, muscle aches, coughs and nausea are also common. In mononucleosis fatigue is often severe and persists for weeks after the resolution of the picture. Enlarged lymph nodes in infectious mononucleosis are a bit different from the lymph nodes of common pharyngitis and affect mainly the posterior neck chains often spreading to the rest of the body. A tip for the differential diagnosis between bacterial pharyngitis and mononucleosis is that in the latter there may be the appearance of a rash (red spots) on the body after the initiation of antibiotics, mainly amoxicillin. A classic situation is that patients seek a doctor for strep throat and get a prescription of amoxicillin for treatment. The patient begins to take antibiotics and red spots appear hours later through the body. Another characteristic sign of mononucleosis is an enlarged spleen, called splenomegaly. When this occurs, it is necessary to rest because of the risk of rupture. The splenic rupture (ruptured spleen) is rare but when it happens it takes the risk of death due to heavy bleeding that happens. The spleen increases size which can be palpable below the ribs on the left abdomen. Liver involvement is not uncommon and can lead to the development of hepatitis with jaundice in 20% of cases. Other described complications, but less common, are the Guillain-Barré syndrome and facial paralysis. Mononucleosis usually does not cause problems when gained during pregnancy. No evidence of increased risk of malformations, miscarriage or premature birth. A fact that causes confusion, even among physicians, is the difference between the disease infectious mononucleosis and mononucleosis syndrome. The first is caused by the Epstein-Barr virus and is the subject of discussion in this article. And mononucleosis syndrome encompasses all diseases that may present with sore throat, swollen lymph nodes, fever and an enlarged spleen. Among them is HIV, cytomegalovirus, toxoplasmosis and lymphoma. Therefore, having Infectious mononucleosis is different from having a mononucleosis syndrome. The diagnosis of mononucleosis is made by clinical presentation and is confirmed by blood tests. In the CBC mononucleosis is a typical finding increasing the number of leukocytes (leukocytosis) caused by increased production of lymphocytes (lymphocytosis), i.e., the patient has leukocytosis and lymphocytosis. When the liver is affected, there may be elevated liver enzymes, SGOT and SGPT calls. The definitive diagnosis, however, is done by serology for antibodies. The most common is a simple test called monotest. The treatment is based on symptoms and rest. There is no specific drug for the virus and the frame usually resolves spontaneously within two weeks. Due to the risk of rupture of the spleen, it is recommended to avoid exercise for at least four weeks. For many years chronic fatigue syndrome was associated with mononucleosis. However, today it is known that fatigue is different from mononucleosis. The prolonged fatigue that may occur is not normally associated with the other symptoms of the syndrome and reactivation usually runs weaker than virus.